Encouraging butterflies to your garden can be slightly complicated for the beginner as these insects are less mobile than birds for example, and some species are unable to travel long distances. Some however, especially the painted lady and red admiral, are very mobile indeed and visit us in the summer in the same way that migratory birds do. While we can feed our garden birds and almost guarantee that some will come to our gardens, butterfly gardening is a little more about creating the habitat that they need to live and importantly, to breed. If you can do this, you will not only have the pleasure of seeing them in your garden, but also you will be contributing to the survival of some species. However you want to encourage butterflies, there is one certain way of making sure that a few at least come to your garden. Planting a Buddleia to attract the larger species such as small tortoiseshell, red admiral, painted lady and peacock will ensure that these butterflies will find you, and marjoram or lavender will cater for some of the smaller species including gatekeeper and common blue if they are around in your area. Growing nectar plants for butterflies is easy - most of them are pretty garden border plants that look good in the garden anywhere, although butterflies will prefer them if they are in a sunny south facing and warm spot. Shelter is good too, as butterflies are not fond of windy conditions. 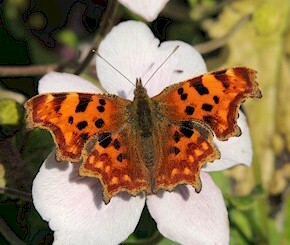 Many plants will attract butterflies but it is good to have a selection that flower at different times. Early butterflies appreciate the nectar from dandelions but aubrietia and honesty are also good plants for the spring months. The wild flower, lady's smock, is a great plant for orange tip butterflies both as a nectar plant and as a larval food plant - the plant upon which they lay their eggs. In mid summer there are many plants that will bring a range of butterflies to your garden and some of the links below will give you ideas. Try to include a good range of different species - for example catmint and purple loosestrife are good for the white butterflies and candytuft, marigolds, knapweed, thistles, globe thistle, cornflower and heather will attract a range of other species. Later in the year, nectar plants that carry on flowering in to September and October are especially useful for butterflies that hibernate as adult insects through the winter. Echincea, late flowering Chrysanthemums, heliotrope, sunflowers, Verbena, some small-flowered dahlias, Cosmos and ivy are all good food sources for late in the year, attracting red admirals, small tortoiseshells and painted ladies. It is worth remembering though that different plants can be good in different gardens - your garden 'micro-climate' and its situation play a part. Encouraging butterflies to breed takes a little more thought than simply providing them with food. In order to breed they need very specific plants on which to lay their eggs. Some butterflies (for instance the brimstone) will generally use two plants only. Others use a range of plant species. The female butterfly will seek out her larval food plant, lay her eggs carefully and then leave them to develop. The caterpillars will eat the leaves of the plant, pupate and then hatch as adult insects either later that same year, or in some species not until the following spring. Good caterpillar food plants are nettles (for red admiral, small tortoiseshell, peacock), lady's smock and honesty (for orange tip), sheep sorrel (for small copper), native grasses (for meadow brown, ringlet, speckled wood, gatekeeper), bird's foot trefoil (for common blue), alder buckthorn and purging buckthorn (for brimstone) and holly and ivy (for holly blue). Creating shelter in the winter is very important if you want to encourage butterflies. Even though we don't see them between November and March they are still around somewhere! Some butterflies including brimstone, peacock and small tortoiseshell over-winter as adult insects. They find dry, sheltered places in log piles, sheds, garages or in the case of brimstones amongst dry leaves in a sheltered spot, and they sit out the cold weather in hibernation. Other species survive the winter as tiny caterpillars, as eggs or as pupae, so all four stages of the butterfly life cycle could be around in your garden somewhere through the winter. A very tidy garden is less likely to have good hibernation places for these insects. If you have a wildflower meadow don't cut it too short as the caterpillars of the common blue spend the winter deep down in the grass. Borders should be left through the winter and 'tidied' in spring when wildlife is on the move again. Always be aware that your garden is a home for many creatures at all times of year.